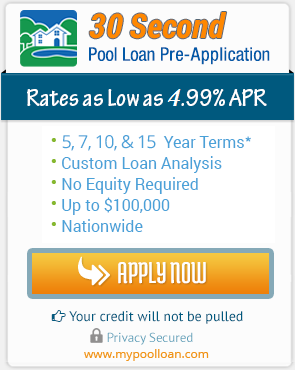 Why Should You Finance a Gunite Pool? If you and your family are considering a pool, why not think about a gunite pool? These inground pools have a lot to offer the family and will look great in any yard. Sit and imagine yourself in a pool, surrounded by family, with a drink in your hand, as you realize what it is like to feel truly peaceful. A gunite pool can do this for you. Hop on board as we look at the reasons to finance a gunite pool for your home. The top reason to have a gunite pool in your backyard is because they are a great way to let your creative side out. Many do not realize that a gunite pool can be created into any shape. Rectangle, circular, oval, an odd shape, the homeowner can decide what it right for them based on personal preference and the shape of the yard. A backyard may not have room for a big rectangular pool, but would have room for one shaped as an octagon. Gunite pools may also have a variety of finishes on them. There are plaster finishes that come in a wide variety of colors to coordinate with your home or the rest of your backyard color scheme. No need to go with the standard white if you do not wish to, although many homeowners like the classic look of it. Maybe you want to add beauty to your backyard with tiles? Tiles offer a highly customized look since both the colors and the pattern can be chosen by the homeowner. Tiles are built to last and only require regular cleanings and occasional re-grouting to maintain them. One or more tile colors may be used to create a pattern on the floor of the pool. Many homeowners have gone with different designs on the floor of the pool from suns to fish. Aggregate effects may also be used in a Gunite Pool. Aggregate is a ceramic coated sand that comes in many shades. A pool with this sort of finish is truly unique in the fact that the homeowner can pick the hue they like for their pool, and the texture and color will be different from that of any other pool built. Another popular choice for pools is to use beadcrete for a finish. This is like a pebble finish, but only much smoother. The formula, made of glass spheres that are locked into a cement that has been modified, comes in many colors. It has a glowing 3d effect to it when light hits it. Gunite pools look great by themselves but a homeowner can really dress them up. They can add waterfalls to fountains. Both will add appeal and beauty to the pool area, and give hours of entertainment to those that use the pool. Waterfalls have a calming look and sound to them, and kids love swimming under them. Fountains can be used to play games around. Slides may be installed either alone or incorporated into a waterfall for a unique look. Gunite pools are very durable. Gunite is smooth to the touch and is made from sand, water and cement. This mixture is applied to the surface in order to bond tightly to the steel rebar framework. There are many other reasons to adorn your home with a gunite pool. They can have walk in steps, which will be perfect for those who have trouble with steps. Water seats may also be installed, for those who just wish to sit and relax in the pool without swimming. Islands can be fit into a pool to give a customized look and add more of a tropical feel to it. No matter what your ideal pool is, a gunite pool can help you to achieve it. With many different features, finishes and colors, the pool can be unique to you and your family. So sit back and think what would be the ideal oasis when it comes to a pool for your backyard. A pool with a huge waterfall, or one with a slide for the kids? One that has boulders incorporated into it? A diving board? A negative edge? The possibilities are endless, thus giving you permission to create your own unique paradise.